I said in the beginning that I would give everyone a list of the stuff I have done to the bike, I also wouldn`t mind writing this down while I still remember. Firstly the choice of bike and why. The bike itself is a Suzuki DR650SE 2007 model. There have been basically no changes to this model bike since 1996 except the colours, which usually would indicate that the bike would be very reliable. By all reports it is, but I`ll tell you for sure when I get back! This bike was chosen for a few reasons, but the bottom line was cost! Brand new these can be purchased for around $A8000, the other bikes that would fit into this catogary are around double this. The only other bike in the price range is the Kawazaki KLR650 which is similer, maybe slightly more road orientated and is water cooled. The old model I liked, but for 2007 Kwaka have released a brand spankin new one which I hate. Really it just looks rubbish (thats subjective of course, as with all the stuff I go on with). 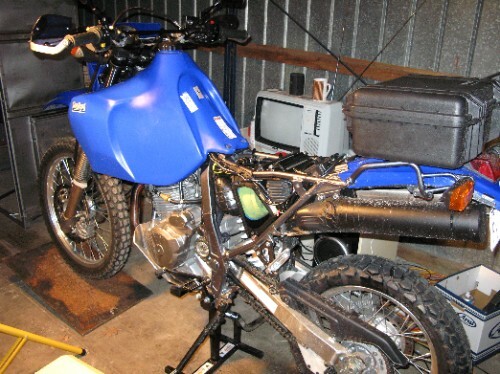 Of course the other 2 major bikes for this type of thing are the KTM 640 Adventure and the BMW F650. I would never have bought the BMW just because (again) I don`t like it, it is probably reliable and certainly made out from all the advertising to be the perfect bike for this job. But when it comes to bikes I think you need to buy them with your heart as well as your head, its no good sitting on some bike you hate for 15,000km just because someone else told you it was the right bike for the job! The KTM I do like, but at about $A15,000 new and very hard to find secondhand (plus I really didn`t have the time to look) it seemed a bit crazy when the DR was nearly half the price for a brand spankin new one! I`ll just add too that it seems strange that Honda and Yamaha do not have a model of this type of bike anymore, they have done in the past (I think they were both Dakar winners too!) but haven`t built them since the `90s or maybe early`00s. Strange when it seems to me that this "dual sport" type of bike is all the go with heaps of people doing big on/off road trips at the moment. It`d be good to see both models make a comeback. All that said the DR does lack in plenty of areas compared to the KTM and maybe the BMW. Suspension travel is relatively short and soft, but for me being a little bloke (Japanese size) at 68kg, 172cm, not being able to ride like Cyril Depres and this trip not being the Dakar it`ll do. Bigger tank, 30l banger from RVAqualine. Maybe not necessary but I hate stopping to fill up! Usually get around 6-700km out of it. Bit heavy when completely full, but if you don`t fill it completely (about 2-3l less) it feels really good as the weight is centered quite low for such a big tank. Smart design and Australian of course. Higher, wider Renthal handlebars makes it feel more comfortable sitting and standing. Barkbusters because holidays are more enjoyable when your levers (and brake reservoir) are in one piece and for added wind protection. Heated grips..... because I`m soft. Staintune exhaust due to this being the quietest stock bike ever! I can`t believe how quiet it was, the Staintune fixed that, made it heaps more responsive and saved a bit of weight! Homemade toolbox, as seen in above photo, just extended the stock one with PVC pipe! Removed the rear mudgaurd so I can roost the Russians a bit better and built my own number plate holder with LED number plate light. I went for Andyz Thingz soft pannier bags (you don`t have to say all your s*** will get stolen with soft bags, everyone else already has) and a lockable Pelican brand box on top for the cameras and anything I really don`t want stolen. Hard panniers would of been nice in some ways, like having a convoy of SAS soldiers follow you all the way would of been nice.